India’s popular 2 wheeler manufacturer, Bajaj Auto has updated their website with 125cc version of Bajaj V model. The teaser of Bajaj V12 in Bajaj’s official website reveals that the price of the motorcycle is INR 56,283 (ex-showroom Delhi). Like Bajaj V15, Bajaj V12 too carries the USP that the motorcycle was built by using some amount of metal from INS Vikrant which was decommissioned from the Indian Navy. While Bajaj V15 is powered by larger 150cc engine and is priced at INR 62,132 (ex-showroom Delhi), V12 comes with 125cc engine and is priced at INR 56,243 (Ex-showroom Delhi). The all new Bajaj V12 motorcycle is powered by 124.5cc, single cylinder, air cooled engine. The motorcycle churns out 10.39 bhp of power at 7,500 rpm and 10.98 Nm of peak torque at 5,500 rpm. V12 is mated to a five-speed manual transmission gearbox. Bajaj V12 has a different suspension components than the V and the Bajaj V12 unlike the Bajaj V15 that comes with 130mm drum brakes at the front and rear and does not get a front disc brake even as an option. When it comes to dimensions, Bajaj V12 is shorter and lower than Bajaj V15 and is 5mm wider. Both Bajaj V12 and Bajaj V15 has a similar ground clearance and wheelbase. 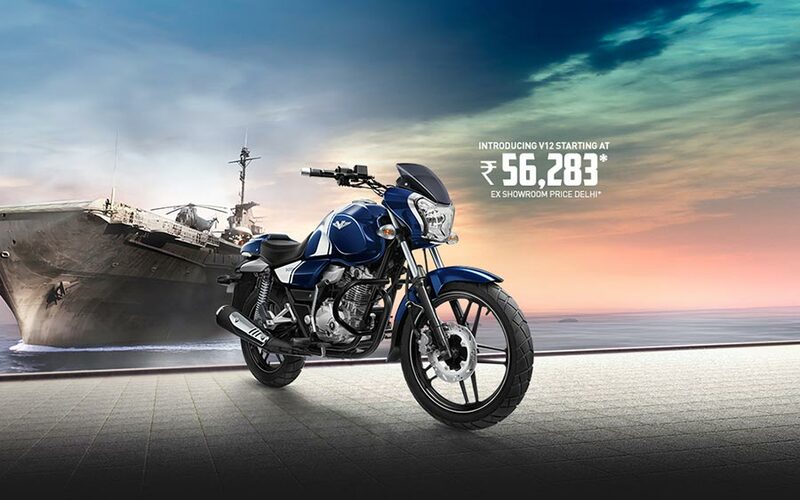 Bajaj V12 costs INR 5,000 more than Bajaj Discover 125.